We live in an era that embraces self-care. That means being overly busy to the point of exhaustion is out, and prioritizing your well-being and personal health is in. What a lot of people don’t recognize is that self-care is an important aspect when it comes to weight loss. Get rid of the toxic behavior and follow the self-care tips listed below to be successful in your weight loss journey. Did you know that lack of sleep slows down your metabolism and brain function? Sleep is a crucial part to weight loss and sometimes not getting enough of it is the major factor holding people back from reaching their target weight. We all have reasons why we stay way past our bedtime but mostly, it’s due to inane things like binge-watching a TV show or finishing up a novel. Being sleep-deprived creates a vicious cycle. When you lack sleep, in the daytime you feel groggy and cranky, making you prone to cravings. 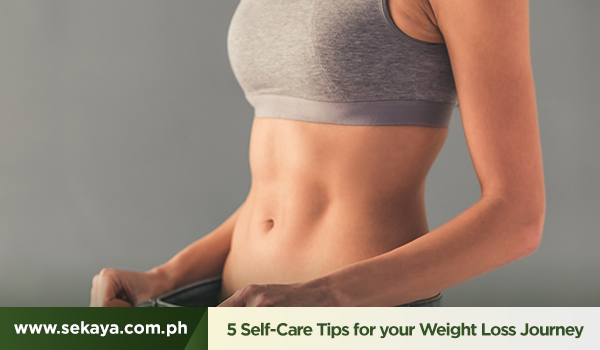 When cravings take over, you tend to choose more indulgent and unhealthy foods, making you feel bloated and sleepy. Then you decide to pour some caffeine or munch on some sugar to get your body going. Before you know it, you are lying on your bed wide awake. Prioritize getting your 7 hours above anything else. If you’re using iOS, the Bedtime feature under the clock app should be useful as it shows charts of your sleeping patterns and calculates the average sleep you get in a weekly or monthly basis. Change your sleep habits and your body will thank you. While it has been debunked multiple times that skipping meals is ineffective as a diet strategy, most dieters just can’t help it. Perhaps you decided to go to work without breakfast because you were running late or you skipped lunch because of a deadline. These are all matters of life getting in the way and whatever happens, you have full control of these situations. This is what happens to your body when you skip a meal: your blood sugar drops making you lose control or irritable due to hunger. Some people call this being “hangry” and it leads to uncontrollable eating of processed carbs and sugar. There is no urge to stop until your blood sugar is rebalanced and you start to feel normal again. While this can sound absurd, plan your meals and stick to the schedule. That way, there’s no reason to skip it because you allotted time for it. This tip varies from person-to-person because there isn’t a one-size-fits-all when it comes to doing things that make you blissfully happy. While some love to exercise or meditate during their “me time,” others express it creatively through journaling or painting. Make it a habit to include a cup of nature’s life nurturing gifts during your self-care time. Sekaya’s Pu-erh Trim is a medicinal drink that originated from China. It helps speed up your metabolism making it an effective partner during your weight loss journey.